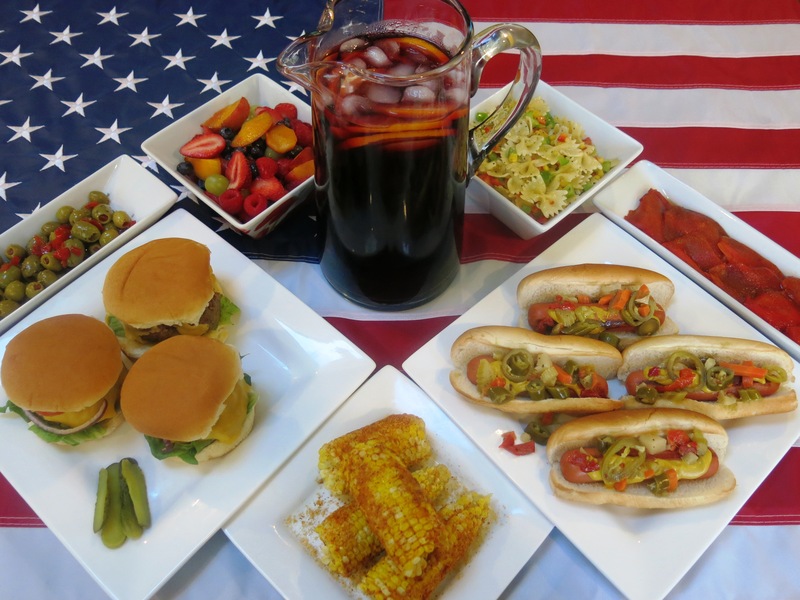 4th of July menu: Let’s celebrate with burgers, hot dogs, salads and sangria! What are you all doing today? Over here, one thing is for sure: the grill will be on 🙂 We’ll grill burgers and hot dogs and we’ll eat plenty of various salads. As for drinks, since I’m pregnant I’ll limit myself to apple juice. 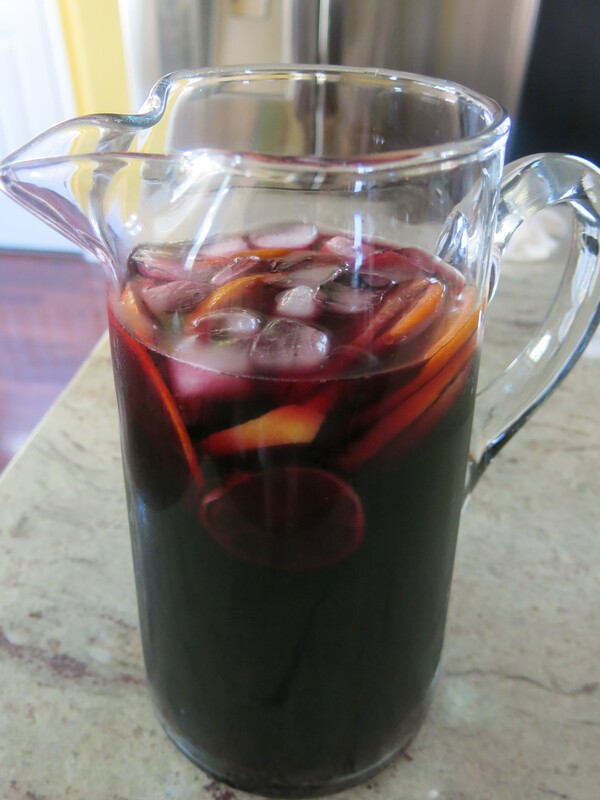 Meanwhile, my husband will enjoy one of our latest flavor discoveries: the Beso del Sol sangria! I was very excited when the Beso del Sol creators asked me to review their product and to build a summer menu around it. Sangria is one of my favorite drinks ever, so why not? We used to drink sangria when we lived in Europe, and we loved it. A refreshing mix of delicious wine and fruity goodness, to me it is the quintessential grown-up summer drink: light and flavorful, it is also alcoholic enough to be taken seriously. 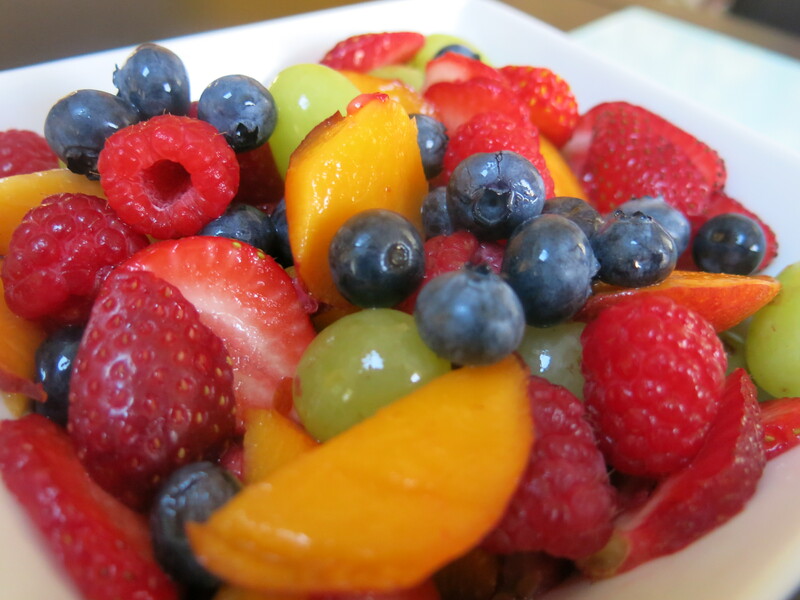 You can add extra sliced fruit when you serve it, or you can leave it as it is. Either way, the fruit used while making the sangria will shine through, rendering an unmistakable flavor and a tantalizing aroma to the original wine. Beso del Sol (“Kiss of the sun”) sangria is imported from Spain and is made of 100% natural Spanish tempranillo wine blended with citrus and fruit juices. Each 3l container is the equivalent of four 750ml bottles with 8.5% alcohol content. 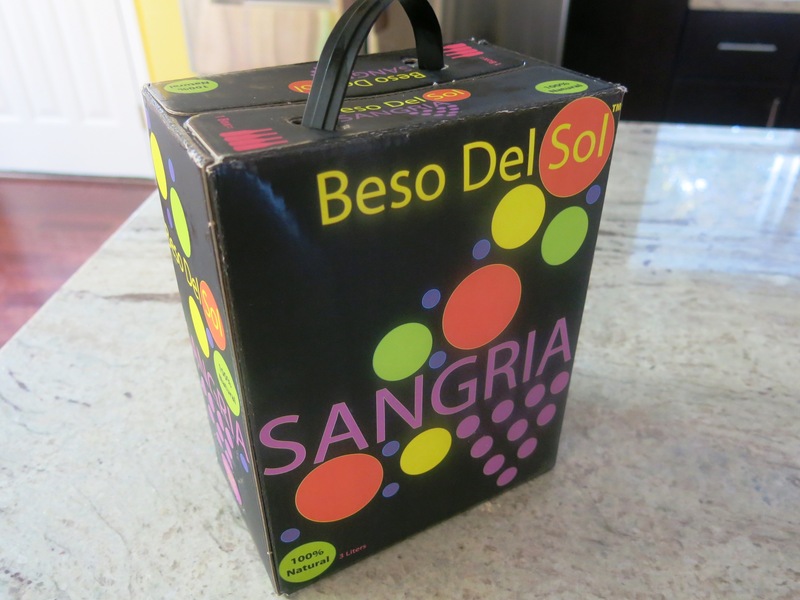 Beso del Sol is also the first premium sangria with a bag-in-box design on the American market. I found the product very easy to store in the fridge – plus, I was happy to hear this sangria stays fresh for up to six weeks after opening. In Chicagoland, Beso del Sol is sold at Angelo Caputo’s Fresh Markets. So, what did I think of it? Since I am pregnant I could not drink the sangria, yet I put some of it on the tip of my tongue, which was enough for me to form an opinion of it. Straight away, the upbeat and fruity flavor reminded me of the sangria we used to drink when we lived in England, which was also imported from Spain. I also asked my husband to try some Beso del Sol, and he liked it a lot. He often gets bored with wine and beer, so switching to sangria was a welcome change. He was very pleased with the clean and refreshing taste of Beso del Sol and commented several times on how well this drink went with the whole “summer celebration” theme of my post. In honor of the 4th of July and of our new sangria discovery, I put together a menu to reflect both our past and where we came from, and our present, for which we are so thankful. This menu is thus a marriage between the “old world” and the “new world” and their various culinary traditions, and to me, it is flavorful, meaningful, and fit for a glorious summer. 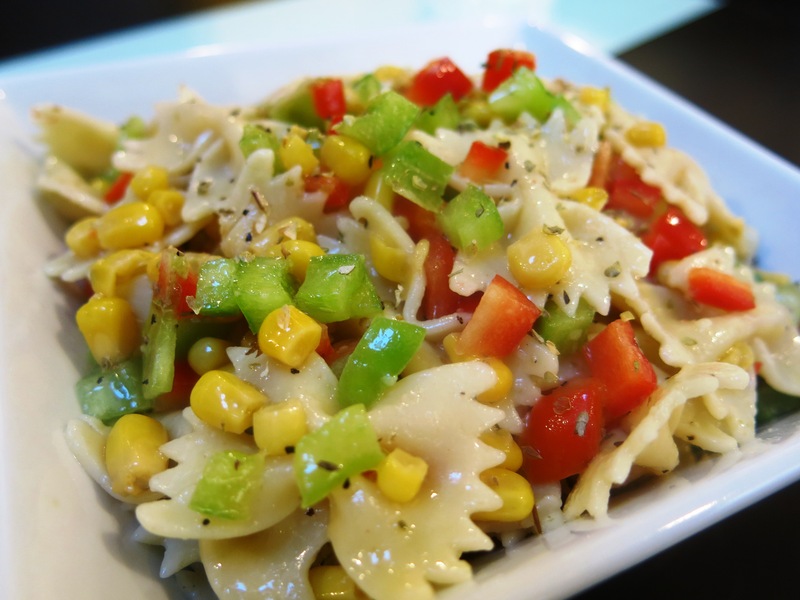 To begin with, I made a pasta salad with farfalle and sweetcorn, to which I added finely diced red and green bell peppers for color and texture. I used a splash of olive oil, salt and pepper, and our favorite herb: oregano. The aromatic oregano elevated the overall flavor palette of the dish. 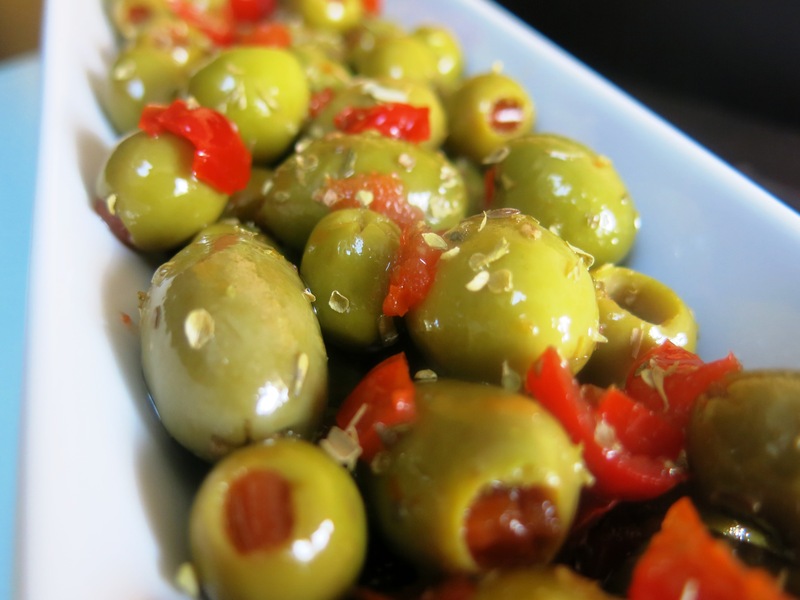 I had two small jars of pimiento-stuffed olives in my pantry, and I thought they would make a great accompaniment to the sangria. I took them out of the jars and mixed them with diced peppadew peppers. (I wrote about my love of peppadew peppers here) I also added olive oil and oregano. This recipe is quick to make and it’s always a hit in our house. We eat plenty of corn on the cob every summer, and I usually just boil it and serve it hot with salt and melting butter. This year I really wanted to do something special, and in my quest for a new approach I was inspired by the delicious corn on the cob I ate at the Mezcalina restaurant back in March. 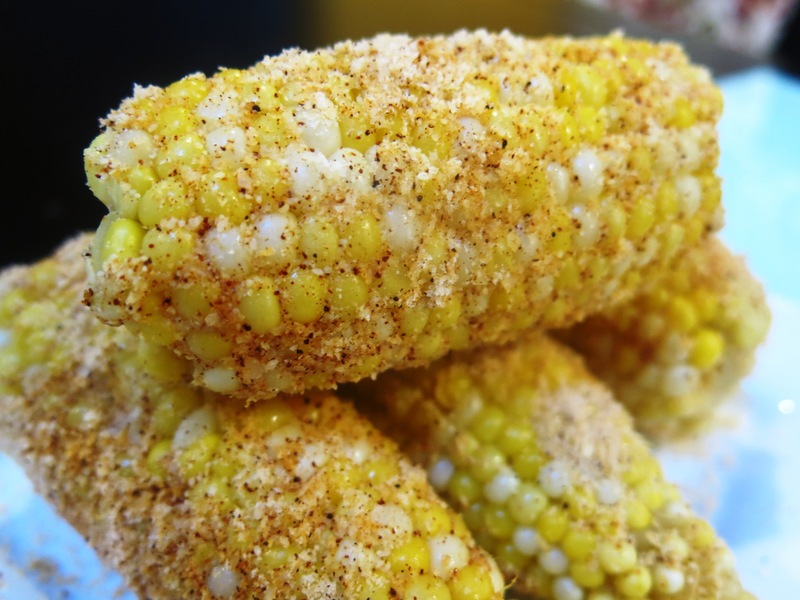 After smothering the corn in butter, I covered it in a mixture of parmesan cheese and chili powder. It was so good and so different from the corn on the cob we usually eat! I’ll definitely keep experimenting. 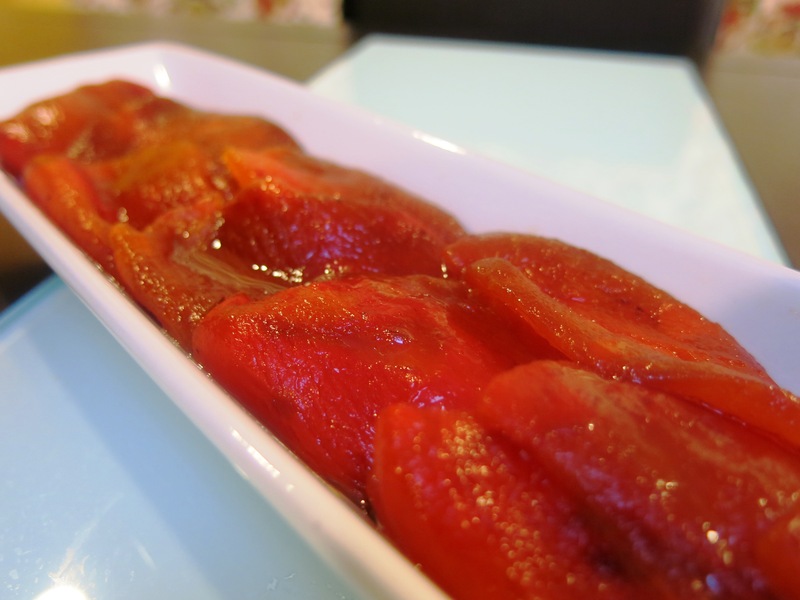 If you’ve been following my blog for a while you know that we absolutely love roasted peppers! Naturally, they just had to be on our 4th of July menu. I roasted red bell peppers, cleaned them and made a quick salad, adding only salt and a basic vinaigrette (3 parts olive oil to 1 part white wine vinegar). The unique smoky flavor of the peppers was amazing! Naturally, the burgers and the hot dogs were the centerpieces of the meal. I bought ground beef and added a ready-made hamburger seasoning mix (1 tbsp seasoning per 1lb meat). 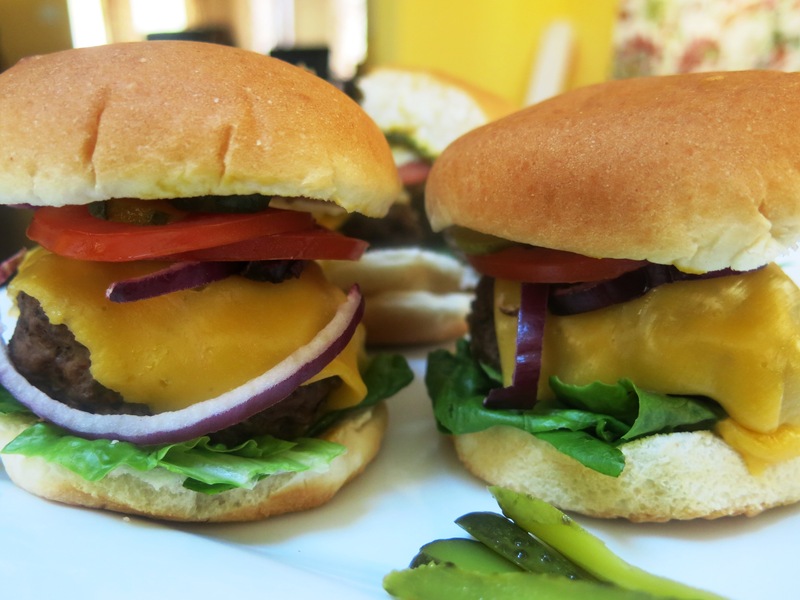 I stuffed each burger with cubes of cheddar cheese, which melted beautifully inside the meat, giving it extra moisture and creating a messy yet delicious flavor combination. I served the burgers on buns lightly smeared with mustard, with sliced tomatoes, pickles, lettuce, and red onion rings for crunchiness. 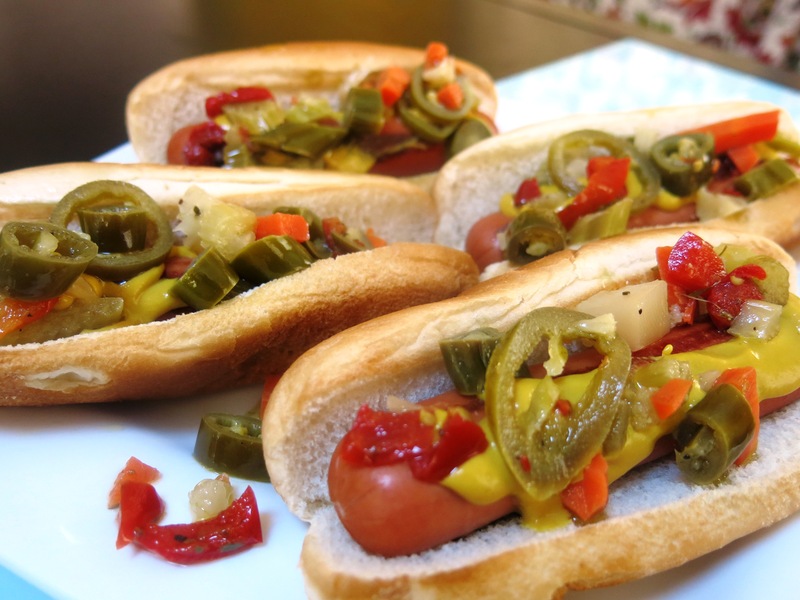 I didn’t want to overthink the hot dogs, so I served them with mustard and a load of sliced hot peppers for an extra spicy kick. For dessert I made a fruit salad with strawberries, raspberries, blueberries, nectarines and grapes, all drowned in a syrup made of water, sugar and lemon juice. Simple, pure, and delicious! *Disclaimer: Beso del Sol sent me a giftcard which I used to purchase the sangria and the menu ingredients. All opinions expressed here are my own.